This year, AITF 2016, the region’s leading travel and tourism exhibition will mark its 15th anniversary. Over many years, AITF has established itself as a key event and a hub for the Caspian region’s tourism industry, where important meetings are held, partnership agreements are made, and new programmes and destinations are launched. The tourism industry is one of the country’s promising non-oil sectors. Azerbaijan’s government has always shown support for AITF. In the last few years Ilham Aliyev, the President of the Republic of Azerbaijan, has toured the exhibition and met with exhibitors. 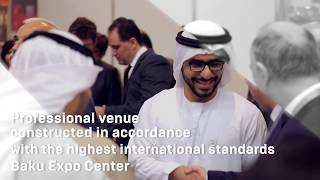 Such attention to the industry and to the exhibition itself from the country’s government gives additional impetus to the development of business relations in the tourism sphere. Since its inception AITF is supported by the Ministry of Culture and Tourism of the Republic of Azerbaijan. The exhibition is also supported by the regular participant Azerbaijan Tourism Association (AZTA) and receives endorsement from international bodies such as the World Tourism Organisation (UNWTO) and the Pacific Asia Travel Association (PATA). The organisers of the exhibition are Iteca Caspian and its UK partner ITE Group. The exhibition’s development and its role in Azerbaijan’s tourism sector are attested to by its growth in both exhibition area and exhibitors. This anniversary year will be no exception; more than 200 companies from 40 countries are planning to present diversity of tourism destinations. Belarus, Bulgaria, Croatia, the Czech Republic, Georgia, the Dominican Republic, India, Indonesia, Iran, Montenegro, Spain, Thailand, Turkey, and Ukraine will showcase tourism potential of their countries at national stands, whilst the Stavropol Krai and Jurmala will hold regional stands. Tourism companies and hotels from Greece, Jordan, Latvia, the Maldives, Russia, Slovenia, Switzerland the USA, etc. are also expected. Numerous embassies accredited in Azerbaijan and chambers of commerce are among the participants of this year. Traditionally Azerbaijan Tourism Association (AZTA) will demonstrate Azerbaijan’s tourism companies, hotels, and sanatoriums at its stand. Ministry of Culture and Tourism of the Republic of Azerbaijan and the country’s regional stands will present Azerbaijan’s rich potential for domestic tourism. As the first exhibition of the spring season, AITF will be a central platform for discussions, meetings, sharing opinions and proposals in the tourism sector. Exhibiting companies will present exclusive offers for various tourism destinations. Exhibitors will include tour companies, airlines, national and regional tourism organisation, hotel chains, real estate agencies, sanatoriums, health resorts and spa centres, sport and eco-tourism facilities. The Medical and Health Tourism sector continues to grow offering local and international medical and health centres. In recent years, AITF has also been developing its Real Estate Abroad sector, reflecting the growing demand for property in popular resorts outside Azerbaijan. In order to help exhibitors to take advantage of travel professionals and suppliers being in one convenient location, AITF 2016 have launched workshop, a dedicated area where participants can hold direct negotiations without intermediaries and initiate contact with leading local travel agencies of their choice through preplanned meetings. As a platform for discussion, the exhibitions will help professionals to share experience and make useful contacts. To mark the anniversary of the exhibition, the organisers have planned an interesting programme of additional events to leave positive lasting impressions of Baku. AITF exhibition will be open to only professionals from 7-9 April and welcome all visitors on 9th of April.